It should be harvested the Same Day You Will Install it. You can buy your sod from a big box store that stores pallets of sod drying in the sun for days at a time. Buying from a big box store may be very convenient, but you give up quality. Why risk installing stressed grass that won’t look as good. Our advice… Always buy your sod from a sod farm. You should purchase your sod, farm direct. 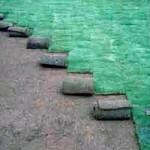 By buying from your local sod farm, you will get fresh sod, harvested the same day you want to install it. Buying sod from your local Vancouver, WA sod farm, Far West Turf couldn’t be easier if you live in Portland, Oregon or South West Washington. Simply call us and let us know how much you need and make a payment on your credit card.